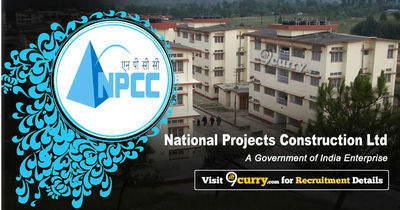 NPCC Recruitment 2019 - Below are various recruitment notifications published by National Projects Construction Corporation Limited / www.npcc.gov.in. As of now, we don't have any active recruitment notification by NPCC featured here. We may update as soon as the organization announces a new job notification. If you are looking for any information related to previously organized recruitment drives by NPCC, you can browse through previous job notifications mentioned below and get the new updates or information you are looking for. NPCC Recruitment 2018 - Job notification for Site Engineer & Junior Engineer Posts in NPCC, Shillong, Meghalaya on Contract Basis. Applications are invited by National Projects Construction Corporation Limited Within 21 days from the date of publication of advertisement for 9 vacancies. NPCC Recruitment 2018 - Job notification for Site Engineers (Civil) Posts in NPCC, Uttarakhand on Contract Basis. Applications are invited by National Projects Construction Corporation Limited Within 21 days from the date of publication of an advertisement for 8 vacancies. NPCC Recruitment 2018 - Job notification for Jr. Engineer & Assitant Posts in NPCC, Assam on Contract Basis. Applications are invited by National Projects Construction Corporation Limited Within 21 days from the date of publication of advertisement for 5 vacancies. NPCC Recruitment 2018 - Job notification for 15 Site Engineers & Junior Engineer Posts in NPCC, West Bengal on Contract Basis. Applications are invited by National Projects Construction Corporation Limited on or before 22 Oct 2018 for 15 vacancies. NPCC Recruitment 2018 - Job notification for 10 Assistant Posts in NPCC, Ranchi, Jharkhand on Contract Basis. Applications are invited by National Projects Construction Corporation Limited on or before 09 Oct 2018 for 10 vacancies. NPCC Recruitment 2018 - Job notification for 12 Site Engineer (Civil) Posts in NPCC, Karnataka, Tamil Nadu, Kerala on Contract Basis. Applications are invited by National Projects Construction Corporation Limited on or before 21 Sep 2018 for 12 vacancies. NPCC Recruitment 2018 - Job notification for 14 Senior Manager & Dy Manager Posts in NPCC, Gurugram, Haryana on Regular Basis. Applications are invited by National Projects Construction Corporation Limited on or before 19 May 2018 for 14 vacancies. NPCC Recruitment 2018 - Job notification for Site Engineer (Civil) Posts in NPCC, Noida, Uttar Pradesh on Contract Basis. Applications are invited by National Projects Construction Corporation Limited on or before 01 Mar 2018 for 4 vacancies. NPCC Recruitment 2017 - Job notification for 9 Site Engineer (Civil) Vacancy in Odisha, Andhra Pradesh, & Telangana States on Contract Basis. Applications are invited by National Projects Construction Corporation Limited on or before 20 Oct 2017.